Regular water testing serves as the first line of defense against water quality issues. Yesterday we touched on water quality issues in California involving unsafe levels of Chromium-6, a known carcinogenic compound, in well water. Today we sadly report that the same region of the country, Coachella Valley, California, also has troubles with higher than desired concentrations of arsenic in well water. In addition to high levels of chromium-6 found across the Coachella Valley, residents in east valley also cope with high well-water concentrations of another naturally occurring element: arsenic. Thousands of residents live in areas that contain hazardous levels of arsenic in their groundwater, a problem that would cost millions to remedy. In January 2010, Riverside County environmental health officials knew of wells at 19 mobile home and RV parks that had tested positive for dangerous levels of arsenic ranging from 12 to 91 parts per billion, a Desert Sun probe found. Studies have linked arsenic, a naturally occurring tasteless and odorless element, to risks of cancer when ingested over decades at levels of more than 10 parts per billion, according to state and federal health officials. Children are even more susceptible because of their low body weight. As usual we will bring up one of our favorite water test kit lines, the Arsenic Quick line of home, field and industrial water testing kits for As+3 and As+5 dissolved in water. We like this product Arsenic Quick product line for several reasons including, but not limited to, its use of food grade reagents for improved safety, its fast and easy testing procedures, its ability to detect very low concentrations w/o the use of a meter, and its affordability. For under $20 the average person can get a test kit that will let them know if their well water contains unsafe levels of dissolved arsenic and the testing won’t take more than around 15 minutes. For those in need of more definitive and potentially more legally defensible water testing options, contact your local health department for a list of local laboratories certified to perform the sort of water testing you require. And, as always, if no local labs exist, companies like National Testing Laboratories offer comprehensive water testing packages that include tests for a large number potential of water quality contaminants and critical water quality parameters. Reducing Arsenic levels in Water? Few methods for point-of-use arsenic reduction/removal exist for homeowners except for units such as the Pentek RO-3500 Reverse Osmosis System which bears NSF 58 Certification for the reduction of unwanted drinking water contaminants such as Pentavalent Arsenic, Barium, Cadmium, Copper, Hexavalent & Trivalent Chromium, Cyst, Fluoride, Lead, Nitrate/Nitrite, Radium 226/228, Selenium, TDS and Turbidity. Other, more robust 4 and 5 stage reverse osmosis systems such as the Goldline 5-Stage Reverse Osmosis System also bear the NSF 58 mark and include additional features such as pre and post carbon block filters for additional water polishing. Spread the Water Testing Word! No Comments, Yet... Got Something to Say? Take 15% Off Propur Shower Filters Until April 30th, 2019! 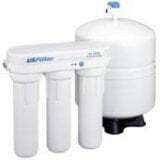 Once you have properly tested your drinking water and learned what quality issues may need attention, then you can begin your search for the right water treatment system to address your unique water quality concerns!